King Hassan had a way with words, and none better captured the essence of President Bush than these. He and President Bush would go on to enjoy a strong and meaningful alliance that would set the stage for an important relationship for decades to come. Less than a decade later, under UN Personal Envoy James Baker, who had previously been President Bush’s Secretary of State, the parties would realize that a referendum was impossible due to irreconcilable differences between them regarding who should vote in such a referendum. In the private meeting that followed, then Deputy Assistant Secretary of State and soon to be US Ambassador to Morocco, Frederick Vreeland, along with other US officials, would share that the King was of the opinion that “the Israelis were going to represent a difficulty in the peace process,” after having discussed the situation with countries involved in the negotiations. 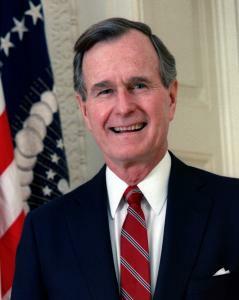 According to Ambassador Vreeland, President Bush was more optimistic and would “press on… [for] we are determined to go all the way with this peace process.” By the end of the meeting, King Hassan reassured the President that Morocco “shall ever be ready to contribute to any peaceful solution.” An official at the meeting also noted that King Hassan would be an invaluable partner due to his strong credentials with the Israelis. The President also thanked King Hassan for Morocco’s participation in the US-led coalition during the Gulf War, it being the first country in the coalition to commit troops to the effort. A White House official would go on to state that Morocco was a loyal ally of the US and its oldest friend, dating back to 1777, when it was the first country to recognize the newly formed United States. The September 1991 meeting was ultimately very successful, and would prove timely in laying the groundwork for the Madrid Peace Accords the following month, and eventually the Oslo accords. In July 1999, President Bush attended the funeral of King Hassan with President Clinton and other dignitaries, including James Baker, and more than 40 heads of state, praising the accomplishments of his good friend and noting the important role he played in the quest for Middle East peace and a more stable world. He would then walk in the funeral procession for three very hot and humid hours out of respect and as a tribute to his old friend. 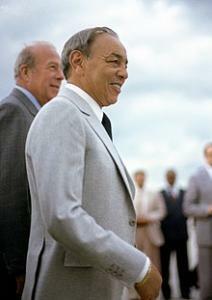 This past Friday, King Mohammed VI sent his deepest sympathies to the American people, expressing “deep condolences and sincere feelings of compassion to the family of the former US president.” He also “welcomed the strong ties of friendship and mutual respect that existed between President Bush and late King Hassan II,” adding that “the friendship contributed to strengthening the diplomatic and strategic partnership between Washington and Rabat.” King Hassan’s comment in 1991 that President Bush had an “unshakable faithfulness toward his friends”proved to be true until the very end.